Every once in a while it pays to stop and think for a minute. It is human nature to see an insect and want to get rid of it. We should rethink that. There are a lot of insects that are harmless. More importantly there are some that help us. 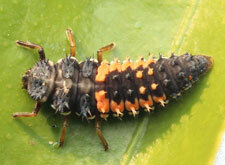 Our scouts have been bringing in good guys regularly, including ladybug larvae (fig. 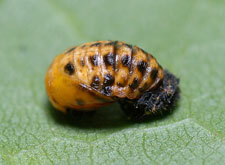 1), a pupating ladybug (fig. 2), and an assassin bug nymph. These insects feed on other insects. Sometimes they do wander into our homes and become a nuisance, but when they are outside, they are beneficial to the gardener. The bottom line is to take a minute to think before you squash or spray an insect. Sometimes they are the good guys. Trunk injection is the most effective alternative to spraying or soil applied pesticides for tree insect or pest control. Arborjet’s trunk injection equipment injects formulations directly into the trunk where it is quickly taken up by the vascular system and distributed throughout the tree. With over 10 years of research and development, our trunk injection systems and formulations are proven to give the best results when protecting trees from pests. The Arborjet drill-plug-inject method is easy to learn and application is quick. The Arborjet trunk injection system is a perfect fit for the do-it-yourselfer but is best applied by a professional, especially for more serious problems. Unlike spraying or soil applications, Arborjet’s system injects directly into the tree, limiting any impact to your family, the applicator, and the environment around you. professionals. Tired of standing next to a newly planted tree with a hose and seeing most of the water running away from the tree into the grass? Then make your job easier and more effective—use a National Seed Tree Watering Bag. The National Seed Tree Watering Bag distributes approximately 20 gallons of water around the base of the tree over a 4-6 hour period. This allows the water to be absorbed into the ground rather than run off. This is very useful when planting a new tree or watering a young tree in the dry time of the year. The IAA Annual Golf Outing provides members with an opportunity to get out of the office and enjoy a day on the course with other arborists. Whether golfing with colleagues, clients, friends or family, arborists utilize the time for networking, fun and enjoying nature. After 18 holes of golf, we all enjoy a great dinner and raffle. Contests include: Closest to the Pin, Longest Putt, Longest Drive, Shortest Drive, Low Score, and Hole-In-One on all par three holes.